← EXCLUSIVE FLASH SALE: 33% off ALL Cookbooks! Thinking about Shalach Manot? Make these adorable fill-able hamantaschen for a fun and affordable packaging option! 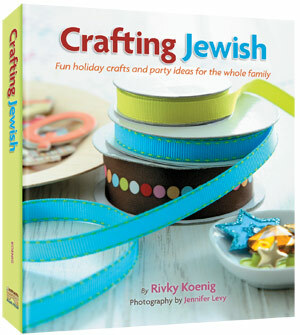 Crafting Jewish by Rivky Koenig helps you prepare for the holidays with creative and inventive crafts geared at enhancing your celebration and giving kids – and adults! – a great time. To help get you ready for Purim, we are sharing one of the Purim crafts in this book. These adorable hamantaschen are perfect for filling with candy and other treats. Some of the other purim crafts in Crafting Jewish include purim puppets, grand graggers, and lots of DIY costumes, masks and hats. 1. Place the plate on the craft foam and trace around the plate. 2. Cut out the circle of craft foam. Place the hamantashen, food, or candy into the center of the circle. 3. To make the hamantash’s triangular shape, lift up two sides of the circle and staple together on top, where the two sides meet. Lift up the remaining side and staple to each of the other sides (see photo). 4. Cut out a square of tissue paper or cellophane slightly larger than the hamantash’s opening. Stuff the tissue paper or cellophane into the opening to cover the food. Optional: Use a 6″-7″ plate as your template to make a smaller hamantash (see photo). Click here for exclusive online savings on Crafting Jewish. Excerpted from Crafting Jewish by Rivky Koenig. Copyright ArtScroll/Mesorah Publications. Adorable craft! So easy and yet has a nice proffesional look! I think we’ll be making these!